6 Who used Mayan Pyramids? 7 What were Mayan Pyramids used for? Mayan Civilisation was the most important of all Mesoamerican civilisations which flourished through thousands of years. Particular advancements in art, architecture, and other domains were seen during the Classic Period of Mayan Civilisation which extended from 250AD to 900AD. During this period, the Mayans constructed a wide range of grand Mayan pyramids, most of which are still standing today in testimony to the grand architecture of the Mayans. Mayans had started constructing pyramids even before the Classic Period and some pyramids can be traced back to the late Terminal Pre-Classic period. For instance, one of the major cities of Mayan civilisation, El Mirador, was a thriving urban centre in the 4th century BC. During this time, pyramids were extensively used as burial ground but this practice declined with the passage of time. But most of the grand Mayan pyramids and other kinds of architecture were constructed during the Classic Period which extended from 250AD to 900AD. During this period, the main centre of activity was Tikal city. There are certain features of Mayan pyramid design and layout that are found in almost all the major Mayan pyramids. The most common feature of Mayan pyramids is of course the stepped nature of these pyramids. Steps generally lead to the top of the pyramid where the Mayan temples are located. 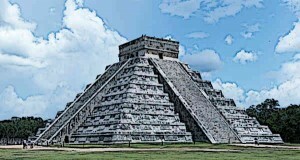 To accommodate the temple, Mayan pyramids have flat top which is another feature of their design. It was also common to align these pyramids and temples with celestial events such as the path of the sun. It was common to align pyramids and temples with celestial events such as the path of the sun. A variety of building materials were used in the construction of Mayan pyramids and temples. The most common building material was the stone that was found locally. Blocks for construction could be obtained from the quarries outside the city. Additionally, mortar was used in the construction process which was made by burning limestone along with wood. Stucco finishing was used for the decoration of temple walls. Some of the most famous pyramids were constructed during different periods of Mayan civilisation. One such Mayan pyramid is High Temple located at Lamanai. This pyramid is 33 meters tall and was still occupied when the Spaniards arrived. Several large pyramids are also located at Coba among which the most famous is Nohoch Mul pyramid which is about 42 meters tall. Other famous Mayan pyramids include the Pyramid of Canaa which is 43 meters tall, Temple 16 at Copan which is 30 meters tall, the High Pyramid at Calakmul which is 55 meters tall, and others. Human sacrifice was an important part of Mayan religion and was particularly widespread during the Classic Period. The most common method of human sacrifice during this period was decapitation. During the Post-classic Period, heart extraction became the most common form of human sacrifice. The sacrifice took place on the top of the pyramid-temple and was performed by the priests. Other types of human sacrifice included killing with bow and arrows and disemboweling the victim etc. There were two main uses of the Mayan pyramids, both of them religious in nature. The pyramids that had temples at the top were used by everyone, although the priests were the guardians of the pyramids and temples. There was another kind of pyramid which did not have any temple at the top. This kind of pyramid was not meant to be touched and was considered sacred. During the religious ceremonies and festivals, everyone used Mayan pyramids. What were Mayan Pyramids used for? The main purpose of Mayan pyramids was performing of religious rituals. It was due to this reason that temples were located at the top of these pyramids. During religious festivals and ceremonies, these Mayan pyramids were also used for human sacrifice and the victims were taken at the top of the pyramids and sacrificed in various ways. Mayan pyramids were sometimes also used as burial grounds although this practice declined with the passage of time. Mayan pyramids were closely associated with Mayan religion and gods. It was common to dedicate temples for certain gods. One such pyramid is the Sun God’s tomb at Altun Ha which is also known as the Temple of the Masonry Altars. Another famous Mayan pyramid is the Pyramid of the Magician or Sorcerer in the city of Uxmal. According to Mayan legends, this pyramid was built by the god of magic, Itzamna as a training centre for shamans and priests. Mayans buried a variety of artifacts in their pyramids and also placed them in the temples on the top of the pyramids. For instance, archaeologists have discovered various artifacts of gold, jade, pottery, and incense from Mayan pyramid at Chichen Itza. In addition to artifacts, the pyramids were also often used as burial ground. Just like other Mesoamerican civilisations, religious and astronomical symbolism was frequently used in Mayan pyramids. A lot of the grand Mayan pyramids were constructed in proportion to the celestial events and objects, such as the movement of the earth. The pyramids were also used for rituals during which the priests would ascend the pyramid from earth to the sky by means of the staircase. This was thought to bring them closer to gods. The construction of Mayan pyramids began during the late pre-classic period of Mayan civilisation. It gained momentum during the classic period which extended from 250AD to 900AD. It was during this period that grand temples in the cities of Tikal and Calakmul were constructed. The sudden decline of the Mayan civilisation after 900AD also resulted in declining practice of constructing pyramids until eventually it was abandoned, although the previously existing pyramids continued to be used. The Mayans constructed some of the largest and most magnificent pyramids in the Mesoamerican region, some of which were being used by the time the Spaniards arrived. The practice of constructing Mayan pyramids had begun in the pre-classic period although it was fully developed during the classic period which extended from 250AD to 900AD. Grand pyramids had temples at top which were used for religious rituals, including human sacrifice.